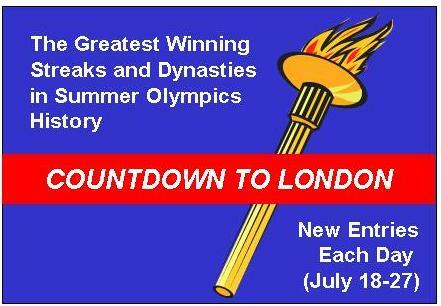 Starting today and running each day until next Friday's (July 27) opening ceremony of the Summer Olympics in London, I will be reviewing great winning streaks and dynasties in Summer Olympic history. I would like to start today with volleyball, both of the beach and indoor varieties. Two of America's best known and most successful Olympic athletes in recent times are the beach volleyball duo of Misty May-Treanor and Kerri Walsh. May and Walsh will be going for a third consecutive gold medal on the sand in London. The two players have faced some challenges over the past four years, including a torn Achilles tendon by May in late 2008 while practicing for the television series Dancing with the Stars. In women's indoor volleyball, the US will be seeking to end an 0-for-11 slump of never winning the gold medal. The most noteworthy string of success in recent decades belongs to the Cuban women, who won the indoor volleyball gold in 1992, 1996, and 2000. One name is most synonymous with success in modern Olympic men's volleyball history: Karch Kiraly. The former UCLA setter helped lead the USA to gold in the 1984 and '88 indoor competitions. Kiraly then returned to Olympic play in 1996, in the then-new sport of beach volleyball, and took home a third gold.